This doesn't count as a tutorial, or even really a craft because it's too simple. But I'm really happy with it. My husband and I have been taking walks together, at the mall because it's really too cold and slippery to walk comfortably outside, and today I was wishing that I had a nice, old fashioned watch instead of checking my phone to see how long we'd been walking. So I stopped in at Claire's at the mall and they had all sorts of clearance as usual. Including Christmas watches for 2.00 each. 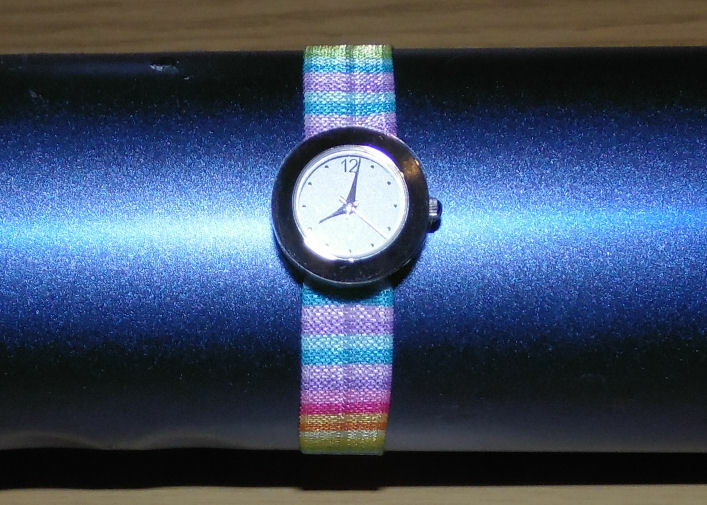 So I cut the band under the watch face and it out of the watch pins, then cut a 9 inch piece of elastic and thread it through the pins, wrapped it around my wrist for a comfortable fit, tied it in an overhand knot, trimmed the ends, and there it is- a watch that I can slip on easily, is really comfortable to wear and it isn't a Christmas watch anymore. If you haven't used foldover elastic- it's the same stuff that a lot of trendy ponytail holders are made out of now- and a pack of 4-5 of them costs a few dollars. But you know what? 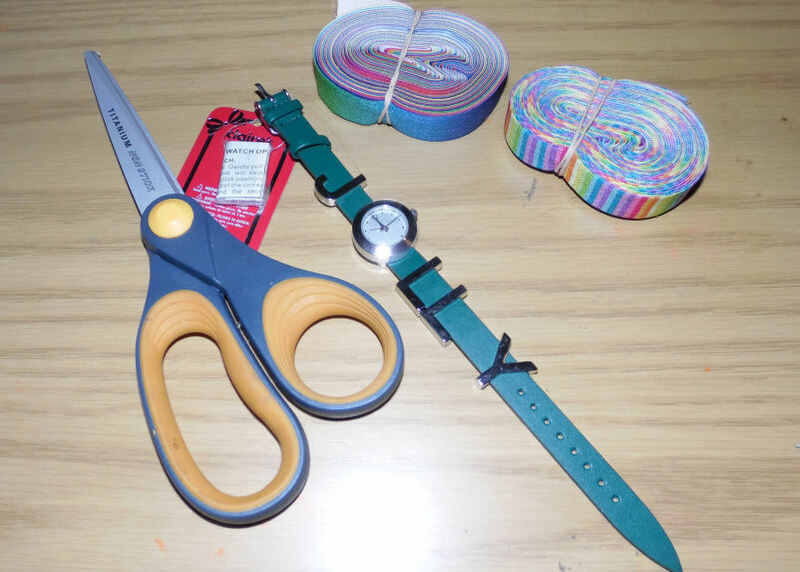 You can buy 5 yards of foldover elastic for the same price, cut it, knot it and make the ponytail holders the size you need. For me, that's "Fit around my wrist" size. For my daughter, it's a bit larger because her hair is so thick. Plus when you buy your own fold over elastic you have all sorts of options for colors and prints. I got the ones shown above from DIY Supplies On Etsy. Great idea! I'm going to try this when my current leather band needs replacing. Thanks! Shoe lacing with fold over elastic- slip on easy!